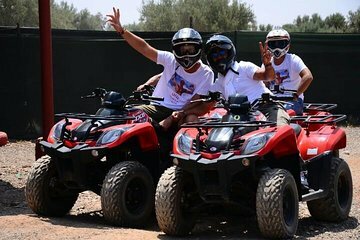 Decole em uma moto-quatro através dos palmeirais de Marrakech nesta excursão de meio dia. Com um guia à frente, acelere seu quadriciclo e passeie pelo Palmerai, o oásis de palmeiras que circunda a cidade. Tecer entre as palmas das mãos, rugir através das planícies do deserto e zoom por wadis e aldeias berberes, parando para o chá de menta em uma casa tradicional berbere. Sua excursão inclui equipamentos e instruções, além de embarque e desembarque no hotel em Marrakesh. The next you go to the berber house where you take a break, sit down, relax and enjoy some tea before your off to the last part of the tour. The first half of the tour seemed longer and it was a simpler ride which i guess was okay in terms of getting use to riding the bike. The second half is where the dunes and drifting is involved. A lot more dusty so be prepared to get dirty. The only thing i would change is the pick up car. Compared to all the other tours this had the worst car as there was no A/C and it was really hot. This is the only tour we would recommend with Viator - Please keep in mind it is NOT Viator who is taking you out on tour but a company they have brokered out too - this is the only trip we would say good choice Viator, it's about time you got one right.